49/190 Max Braden I'd passed over this movie initially because of the muddled trailers, but this is a great addition to the vampire genre. 110/123 David Mumpower I was very much looking forward to an old school vampire movie, but Daybreakers misses the mark, even for fang fans. Most vampire films adhere to the notion that their bloodsucking villains (or anti-heroes, depending on what kind of movie you’re in) need to stay hidden, because as literal parasites, they would be hunted and eradicated by humans. But that’s only because in most vampire movies, there’s so few of them. 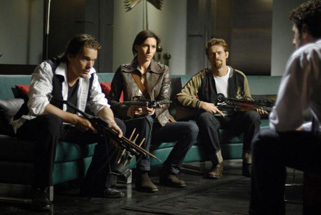 In Daybreakers, the tables are turned and vampires are the majority, after a plague turns most of humanity into creatures of the night. In this future, the few remaining humans are either struggling to stay hidden and fighting a guerrilla war against the vamps, or captured and used as cows to feed the populace. But, in a none-too-subtle allusion to energy crises, that supply is running out. Already turned vampires transform into even more frightening creatures when the blood tap is turned off, meaning that the end of even this form of the human race is about to happen. Ethan Hawke plays the lead “hematomist” for the Vampire nation racing to find a blood substitute when he’s kidnapped by a band of humans led by Willem Dafoe, playing against type by not being a vampire, who believe he can help them find a cure for vampirism, while also leading an assault on the vampire central government (led by a sneering Sam Neill). See the latest developments for this project on the Daybreakers Movie News page.